There are so many portals on which to view content, and while in our parents' day they boasted having 'eyes in the back of their head', today's parents absolutely must have eyes on every device, parental controls on Netflix, install the kids' version of YouTube, home internet security parental controls... and the list of Alcatraz-style, seemingly impenetrable ways to MAKE SURE YOUR KIDS ARE SAFE goes on. Oh, and to make sure you at least try not to feel like you are doing a crappy job of parenting. How often have you heard breakfast TV stories start with: "Reports say..." or, "There are calls for..."
It is almost followed with something that is not really a report at all, and if it's skewed towards parents, it's designed to make you feel guilty. For real. And so Josie's Juice was super keen to learn about Turner Australia's just released 'New Generations' report, which revealed the viewing habits of Aussie kids. The ‘New Generations’ report reveals favourite influencer channels, the most popular platforms and device usage, as well as social media trends and ad effectiveness. Despite the rise of short-form video platforms, TV remains the largest medium in terms of monthly usage for kids, according to Turner’s New Generations report. Who knew! This was a surprise to me. For the record, my kids are iPad and Surface Pro and iPhone (my old one with no SIM card, they are ten... give it time) pros. TV - meh, sometimes. A cute kiddie show in the am, a TV movie snuggled together with the husband for family down time. But there you have it, the stats tell the story. 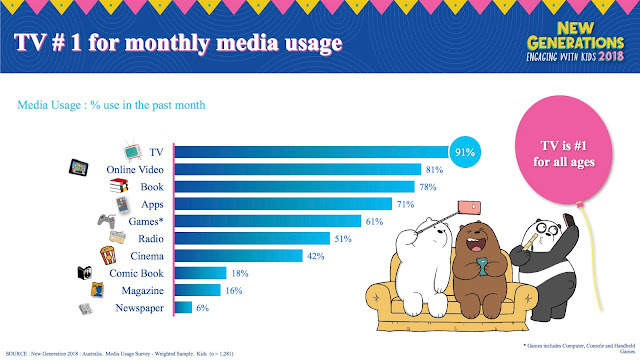 The report adds that on average, kids are consuming more than two and a half hours of television and movies across all devices and platforms on a typical day... yep, per day - no surprise there. And no judgement. It makes total sense, time at home when they're having brekkie and staring zombie like at the TV, on a device in the car when you give them a device to stop the whining... at a restaurant to stop boredom, which for my son would be effective in halting an autism tantrum. He's far more manageable now and can sit quietly, but too long to wait, and it might be on, and in public. Here, here's a device for ya. As I said, not a modicum of judgement here. Kids then spend a further 75 minutes on short-form video platforms. Cartoons remain the favourite type of TV content watched by kids, followed by movies and live-action kids shows. “Never before have children had so many content and platform choices – but TV is still the major player for youngsters, and it’s also clear that they still love animation,” added Mr Webb. This is kinda comforting - we hope old school cartoons are in that mix? Despite high platform consumption, usage of individual on-line video channels remains highly fragmentated, and of the myriad of YouTube channels available, Dan TDM, Ryan’sToys Reviews, Minecraft, Jake Paul and Hobby Kids TV were listed as the top five. Online games overtook school/homework in this year’s survey in terms of key onlineactivities. Minecraft remained the top favourite game for both boys and girls, although recent sensation, Fortnite, was the second-highest favourite title for boys. (My daughter is not into Fortnite, and I am told I should be happy about that? But she IS into Roblox in a big way, and she plays that with friends or with her twin brother. Again, parental supervision is a concern. My daughter reported some bullying which kinda horrified me as it was on a WHOLE other level on Roblox, and now it's supervision plus, and lots of question asking from us). And a final story on this from me. My cheeky daughter "really wanted Instagram, mum!" and I of course resisted. So she just went ahead and created one. It was on when the account was discovered, so now we have passwords and consistent access to accounts (she has a private one, and a really private, private one - SO cheeky). While not professing to be an expert, then best unsolicited advice we can give here is: be actively asking your kids what they're doing, what they're watching, ask how they feel when they watch what they watch, get inside their heads a bit and not only will you discover how their brain ticks, you'll also likely see more of who they are and what tickles their funny bone, their likes and dislikes, how strong characters online make them feel, and how they respond to comments on social media posts, for example. For me I also discovered how very hilarious my daughter is. This can open up even more discussions about how they view the world, and how you can help navigate it alongside them. 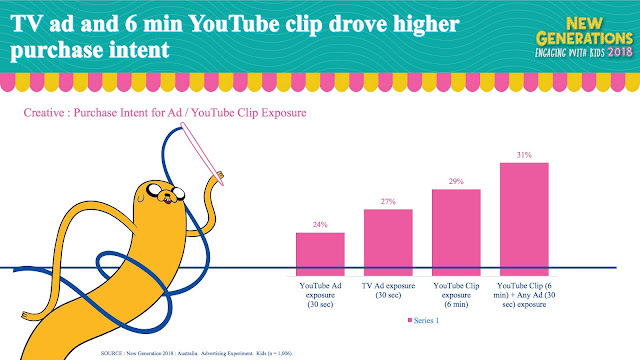 “What we saw was that purchase intent increased when an ad was shown on TV only, compared to YouTube only, but further increased when seen on both TV and You Tube. This information could provide brands with better information to plan their campaigns.”said Mr Webb. Currently in our home the Coles 'Mini Shop' range is receiving lots of attention from my son. As is 'Me Bank', Suncorp Bank with the dancing Harper Beckham lookalike, and anything else with a strong and memorable brand message (welcome to autism world). Is this such a bad thing? In our learning disability world, it demonstrates a solid example of memory recollection and brand association, which we actually kinda love. We think our son will be a bit of a branding expert in some capacity! More about Turner Australia: it's the company behind brands such as Cartoon Network and Boomerang, and YouTube platform Mega Awesome Wow. Turner’s Cartoon Network, the number one kids’ channel in Asia Pacific, offering original animated content including the multi-award-winning global hits Ben 10, The Powerpuff Girls, OKK.O.! Let’s Be Heroes, Adventure Time and We Bare Bears. New Generations is Turner’s pioneering kids’ survey to better understand Australian kids’ lifestyle – their values, aspirations, media habits, consumption, pocket money, opinions, preferences and parental influence. Celebrating its 13th edition in Australia, the long established and respected research has interviewed over 20,000 child-and-parent pairs since its inception.